Pauling was a model builder. He solved molecular structures best when he could see and touch what he was thinking about. So as he was considering how atoms might join together into proteins, he made models, piecing them together in his garage out of wood, wire, paper, pieces of metal, whatever was handy. In his hands, it could be a powerful technique. Take keratin as an example. 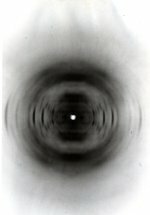 Pauling decided after talking with Astbury that keratin was too large, too complex to solve directly from the analysis of x-ray crystallography images. There were too many atoms reflecting x-rays, there was too much data, the images were too fuzzy. In the days before computers, there was no fast way to crunch all the necessary numbers (data analysis was done by hand, by dedicated personnel in the laboratory. Completely solving simple structures could take weeks or months; molecules as large as keratin defied this sort of analysis). Pauling preferred his own approach: Learn everything possible about the sizes and shapes of the component pieces (amino acids in this case), make reasonable chemical assumptions about the bonds that hold them together, use that information to build models, then see if the model's shape was likely to fit the available x-ray data. It turned Astbury's approach on its head, ending up with the x-ray pattern instead of starting with it. In the late summer of 1937, Pauling tried his model-building approach on keratin. He did not have precise information on the structure of amino acids – no one did, the work had not yet been done – but he did have a sense of the general size of amino acids, a strong belief in Fischer's ideas about peptide bonds and long chains, and some preliminary information on amino acids. His own knowledge of chemical bonds convinced him that peptide bonds would have considerable double-bond character, which meant that the atoms on either side would be held in the same plane. That was a potentially important insight (if it turned out to be correct) but it was basically all he had in the way of a new insight as he puzzled for weeks over the structure of keratin. He considered, he imagined, he made models, and he found that none of them worked. So he thought some more. He found that he could not make Astbury's kinked-ribbon idea into a reasonable model, one that fit his ideas about the peptide bond, included hydrogen bonds, and matched the x-ray patterns. He tried some ideas that wound the chain around into a three-dimensional structure; these did not work either. Astbury's studies strongly indicated some sort of repeating structure in keratin every 5.1 angstroms. Nothing Pauling built could explain that repeat. By September, Pauling was ready to give up. Something was not right. Maybe he was wrong about the nature of the peptide bond. Maybe there was something in the structure of amino acids that he did not understand. Maybe his hydrogen bonding ideas were off the mark. The only way to eliminate the maybes was to go back to basics, start with the building blocks, focus on amino acids and nail down their structures precisely. That was the first step. Next would come close studies of the peptide bond. This was going to be a major project. Amino acids were not giant molecules, but they were bigger than any organic molecule that had yet been solved with x-ray crystallography. To attack their structures, Pauling would need to staff up his laboratory. In particular, he needed a skilled, steady assistant who knew how to produce and interpret x-ray pictures of proteins. He found what he needed in the thin, crooked form of Robert Corey. See Also: "A Program for the Development of Organic Chemistry at the California Institute of Technology and for an Attack on Biological Problems by the Methods of Organic Chemistry and Structural Chemistry." August 7, 1937. See Also: "Robert Brainard Corey." May 5, 1971. "The 94.6-Å Unit of Feather Rachis" approx. February 1953. 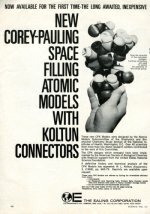 "New Corey-Pauling Space Filling Atomic Models With Koltun Connectors." April 25, 1966.